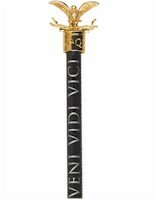 This highly detailed Roman Eagle is made from 22ct gold plated lead-free pewter and mounted on top of a 17.5cm blue or red pencil. The topper is printed with the initials SPQR (Senatus Populusque Romanus), meaning 'The Senate and people of Rome' which was the mark of the Roman Empire and put on buildings, army standards and coins. A 2.5" resin model of the bust of Queen Elizabeth I. The model is supplied in a white box with a label on the front. Resin medium Egyptian cat supplied in a box with an infomation card about the Egyptian cat god Bast. A 2.5" resin model of the bust of Hadrian. The model is supplied in a white box with a label on the front. A 2.5" resin model of the bust of King Henry VIII. The model is supplied in a white box with a label on the front.